If most casual sports fans know anything about professional road cycling that extends beyond the orbit of Lance Armstrong, it’s that a bunch of the people who were in line to receive his seven tainted Tour de France titles also tested positive for performance enhancing drugs. Cycling’s reputation and credibility (particularly among American fans) have been in the toilet for over a decade, and anytime I write a story about cycling, the bulk of the responses add up to a very large neon sign with big blinking red letters flashing out the word DOPING over and over again. The well has been poisoned. Cycling has been in a very real financial crisis (with a worrying amount of WorldTour teams having varying degrees of sponsorship issues) since the excess and mainstream success of the Lance days, and while that’s not all because of the psychic degradation of the product, it’s certainly not an insignificant factor. What the sport needed was a new sort of star, a rider as dominant as Lance Armstrong who was not, you know, Lance Armstrong. Someone who you could believe in while he destroyed all comers. 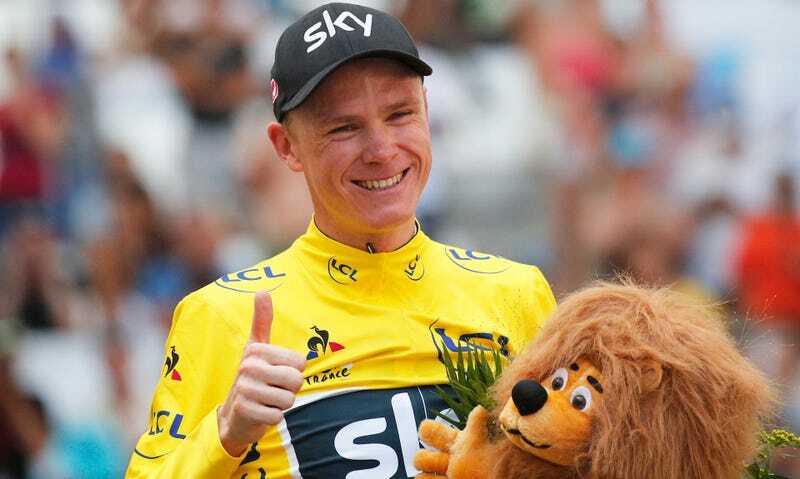 What the sport needed, more or less, was someone like Chris Froome. Froome’s CV is nearly as impressive as Armstrong’s was; he’s racked up four Tours, a Vuelta, and a pair of Olympic medals. Team Sky is the greatest squad that cycling has known since the USPS days and they’ve won a series of huge races all while boasting about their zero-tolerance policy for drug abusers. They’re assholes about it and everyone rolls their eyes at their sanctimony and vast financial means, but they’ve won, consistently, and did so in a way that at least acknowledged the sport’s demons. All of which makes Chris Froome’s potential doping ban all the more damning. One of Froome’s came up at the 2017 Vuelta with twice the legal amount of albuterol, and if the UCI doesn’t find his explanation convincing, then he’s probably looking at a yearlong ban from the sport and the complete erosion of his reputation. It’s hard to overstate how cataclysmic this could be for the sport and for Team Sky, whose bold proclamations about their commitment to clean racing have already been called into question by the mysterious doping saga of their first Tour winner, Bradley Wiggins. Peter Sagan is a legit all-timer, and people enjoy Nairo Quintana, but Froome is the first megastar of the post-Lance era, since the Tour de France is more or less the only race of the season that matters. Nobody’s been as dominant since Armstrong, and if Froome is suddenly branded a doper, what’s the point of trusting anyone? Froome has maintained his innocence and claimed he’s still on track to race the Giro d’Italia and Tour de France next year, though Geraint Thomas has stepped up to lead Team Sky at the Tour and a union of seven teams against doping have called on Team Sky to provisionally suspend Froome. No matter what happens with his appeal, it’s already too late. His reputation has been skunked, and if you’re merely an occasional cycling observer, the most dominant rider of his time falling afoul of UCI drug rules probably isn’t even surprising news. It’s what you expect. It’s worth remembering here that the substance Froome was flagged for is an anti-asthma drug that his team claims he was given by a doctor to combat a well-documented medical problem. Some back-of-the-envelope math shows that he probably took the rough equivalent of 32 puffs of a standard inhaler within a 24-hour period. Cycling rules permit 16, and Froome’s adverse analytical finding highlights the strange gray area of cycling’s doping parameters. Cycling’s governing body is in an untenable position: if the UCI throws the book at Froome, they’re damning their greatest star; if they do nothing, they only reinforce the notion that cycling’s a sport full of dirty cheaters. The damage has already been done, the rest is damage control. Perhaps the problem isn’t Froome or Team Sky, but rather cycling’s doping rules. A raft of supplements, vitamins, and pills are legal, and riders will find ways to broach the cusp of legality with complicated cocktails of drugs like Tramadol and other painkillers. The UCI’s current rules allow for the use of some performance-aiding substances, but they draw a line, intermittently enforced as it is. The history of cycling is the history of cheating, as riders have used cocaine, strychnine, red wine, and motors to overcome the basic truth of racing one’s bike: it’s really goddamn hard. Racing your bike over 2,500 kilometers of the French countryside at 30 mph is nearly a physical impossibility, and no matter the UCI’s best efforts, riders will always be compelled to overcome that daunting physiological truth however they can. What is the point, then, of shoddy enforcement of a vaguely defined and wide-ranging set of drug rules if it harms your riders’ health and reputations? VeloNews’s good explainer on albuterol still involves discussions of pharmacokinetics and spirometry. This is useful, but it illustrates how opaque the rules are. Why, for example, is Tramadol abuse permitted under the rules but a few extra puffs of an inhaler are grounds to suspend someone for a year? Cycling’s credibility rests on the public believing that impossible performances are legitimate, but the sport’s definition of legitimate is so poorly legislated that secrecy and boundary-nudging are the rule of the day. This is the NFL’s moronic catch rule debate, only for obtuse pharmacological propositions. A modest proposal: change the definition of legitimate. The best way to ensure a level playing field, open dialogue between teams and administrators, and keep the sport entertaining would be to simplify doping regulations. The theoretical benefits of the therapeutic use exemption system are muddied by the strange enforcement rules, and the uncertain legality of many drugs leads to a culture of secrecy and silence. Ban Tramadol, but explore bronchodilator and corticosteroid reform. There are drugs banned for legitimate health reasons, though some would help cyclists ride faster and recover more quickly without jeopardizing their health. “Performance enhancement” as a concept may makes some recoil, but if adjudicated evenly, cycling would be a more interesting and enjoyable sport. Financial incentives and razor-thin margins mean it’s going to happen anyway, so it’s better to be honest about doping and set up a clear system. Instead of inscrutable enforcement of doping rules, draw a hard line with multi-year bans attached to those who step over it, but move that line back further. The UCI, of course, will never relax doping restrictions. They’ve bet too much on their drug war (even though it’s cost them the reputations of their biggest riders) to go back now. Where Lance Armstrong was a power-mad tyrant who wielded a hypodermic needle like a sword, Froome is caught in the middle of a broken system, even if he really did cheat. There’s no reason to turn Froome into another Armstrong, but that’s cycling.